Please go here: http://www.sg.tacticalwargames.net/forum/index.php?topic=58.0 and download the three Enforcer Revamp files. Once you have read them, used them, and thought about them please comment here. I AM THE LAW ON NECROMUNDA!!! I thought you might want to clean this one up. Points and before recruiting dead Enforcers. I'm not sure a dead Enforcer is much use to any patrol. It says he doesn't miss a game, so he can't roll result 1 on the chart. But result 6 causes him to miss D3 games. Considering the way you've set the sergeant up he's always going to have bionics for every injury (which I love - Robocop!) so you might as well just say that the sergeant is always considered to roll a 4 - 5 on the medical chart. Giant Killer Experience: Since Enforcers Patrol Teams tend to be better equipment and are trained more rigorously; they will only receive Giant Killer Bonus Experience if they loose a game. I think you mean "lose" here. Scenarios: Enforcer Patrol Teams are always legal gangs, persay, and as such, always roll on the standard scenario chart from the ORB. I'd change that to say something like "Enforcer Patrol Teams cannot become outlaws, and as such, always roll on the standard scenario chart from the ORB." "- Up to one Support Enforcer may be armed with a Heavy Stubber to start with." 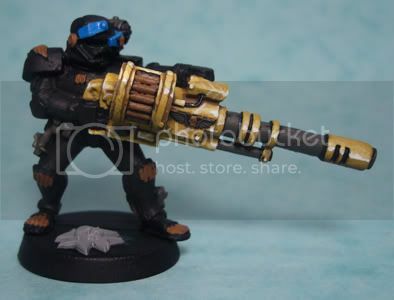 Any chance you'll create a special character Enforcer with an Autocannon? This is entirely selfish, I built this guy below and I want somewhere to use him. That's it for the moment. I'll take another look (and a game or two) later.